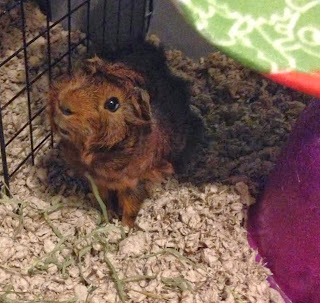 Gruden is a a red headed crested piggy that is quite the squeaky nugget. He loves yogurt treats and will stand on his hind legs to try to receive one. If this doesn't work, he will run up to the second story of the piggy arena and look cute until he gets his treat. He also enjoys shoving his entire head into his hay bag to eat. The youngest of the bunch, Apollo is under a year old. He is an agouti abyssinian piggy. 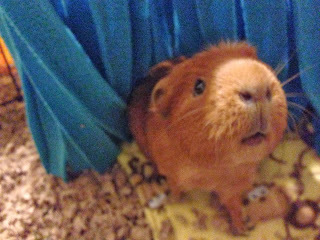 He popcorns - suddenly hopping up in the air and squeaking, which is a sign of happiness - quite a bit, and enjoys sitting on plushy items. He is a big fan of fresh basil.